On Saturday we mentioned the massive coronal hole on our Sun which is ejecting solar wind at a speed which is hitting the Earth's magnetosphere at an astonishing 527.3 km/sec and we were to expect major quakes and we got two, only the third and fourth this month. Quote: Major quakes may well feature in the coming days or we could have a run on volcano eruptions which is what happened at the end of last month when another massive coronal hole faced Earth. 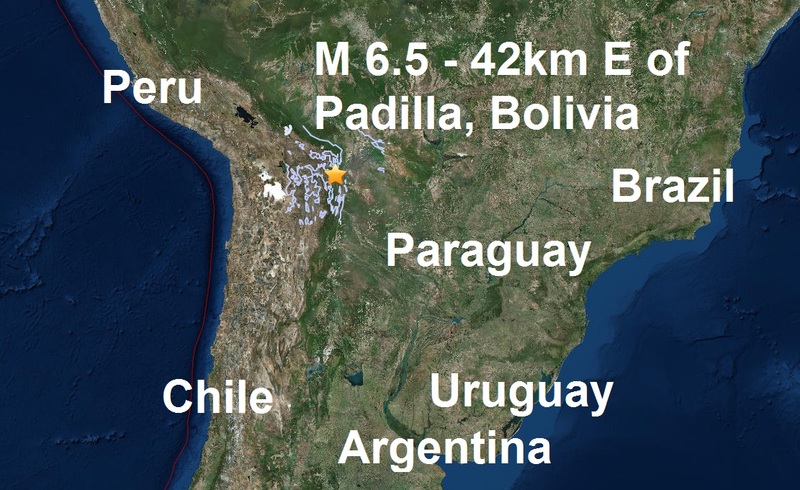 Today a magnitude 6.5 struck Bolivia just a couple of days after a mag 6.3 hit Argentina. Todays strike is the fourth major quake of February and the 11th of 2017.